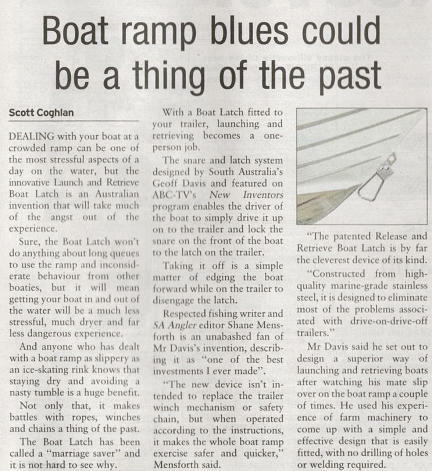 "With dozens of launches and retrieves at both the North Haven and Outer Harbor boar ramps in the past 2 months, we've really come to appreciate the value of the Release & Retrieve Boat Latch fitted to our Dunbier trailer. Designed and manufactured by local inventor Geoff Davis, this clever gadget takes most of the hard work (and wet feet !) out of putting the Stabi-Craft in and out of the water. I'm never keen on getting the tootsies damp in winter time and I send Geoff a silent "thank you" whenever we're at the ramp before or after a fishing session. He has certainly made a lot of improvement to the design of the product since it first appeared a few years ago and I can't imagine launching or retrieving now without it." About 12 months ago I fitted a great locally designed gadget to the front of my boat and about 200 launches down the track I can report that it's one of the best investments I ever made. 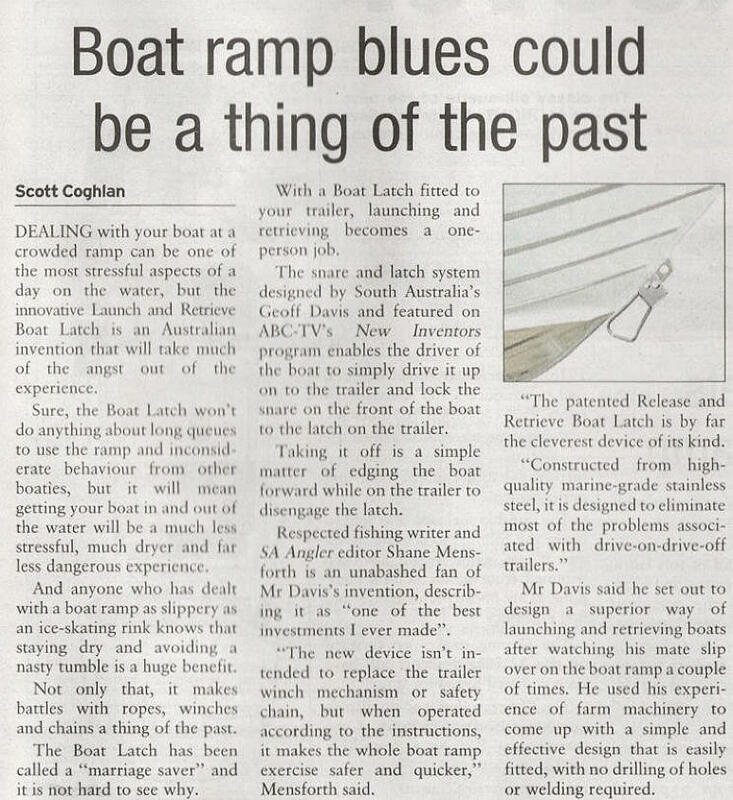 The patented Release and Retrieve Boat Latch is by far the cleverest device of its kind. Constructed from high-quality marine-grade stainless steel, it is designed to eliminate most of the problems associated with drive-drive off trailers. A lot of boaties these days prefer to power their craft on to and off their trailers - a manoeuver which takes a little practice to get right, but ultimately removes much of the effort involved in a manual launch or retrieve. The new device isn't intended to replace the trailer winch mechanism or safety chain, but when operated according to the instructions, it makes the whole boat ramp exercise safer and quicker. It takes about 30 minutes to fit it to the bow of most trailer craft [aluminium or fibreglass] and then remains as a permanent fixture. 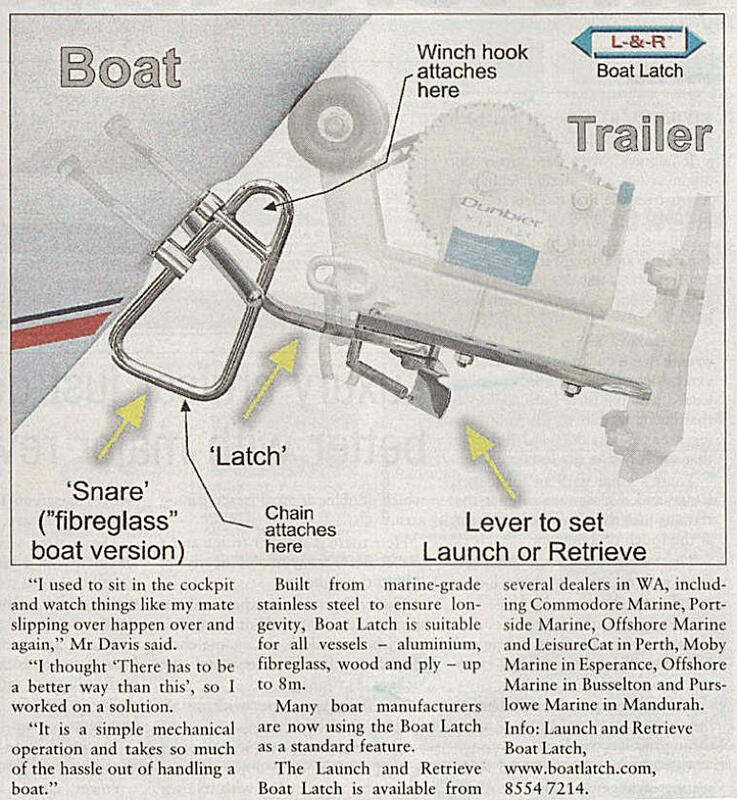 It consists of two components - a latch assembly that is attached to the trailer winch post and a snare that's fitted to the existing bow hook of the boat. When it's time to launch the boat, the trailer is reversed to the water's edge with the latch in the locked position. The original safety chain is then removed and the winch is released so that the boat can move back and be caught by the latch. At this point the trailer winch cable hook can be disengaged and the latch lever moved to the release position. Next step is to reverse until the boat is in the water, start the motor and then power slightly forward. 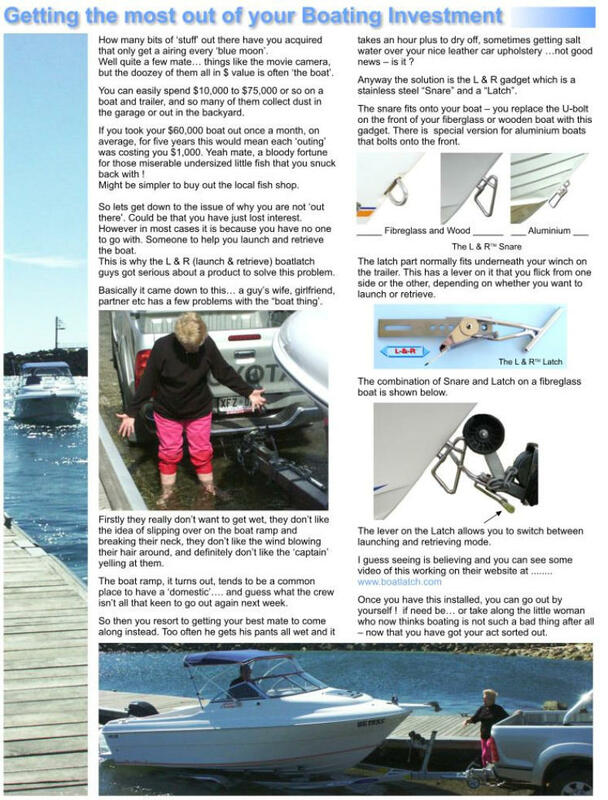 This enables the latch to automatically release and the boat should glide off the trailer. Retrieving is the reverse process. The driver powers the boat up and onto the trailer and rests about a metre from the latch. After allowing the boat to settle and line up straight, the driver then applies more power until the snare component is engaged by the latch. The tow vehicle then moves forward and the winch hook and safety chain can be connected. The rig is then ready to be pulled completely out of the water. In a traditional drive on retrieval, it's necessary for the driver to maintain outboard power to hold the boat's bow in place while someone hooks up the winch cable and safety chain, but this device does away with all this. Biting the bullet and convincing my other half of the huge benefits of avoiding domestics at the boat ramp I did the deed and placed an order. The unit has an elongated catch ring. This is what caught my eye in the first place, as I have had experiences where the boat ramp was excessively steep and the hook on the catch is either above or below the ring and it will not catch. Should you then manually winch the boat onto the trailer, when you drive out and the transom settles the ring damages the hook. The oblong ring alleviates this problem and gives it more scope to receive the hook. When it is all set up, launch and retrieve the boat with an observer at the winch post. After connecting with the trailer drive forward until a metre from the winch post and let the boat settle on the rollers, then gently power forward. Should you gun the boat all the way the bow up attitude will have the retainer ring well above the hook and when it all falls heavily as power is removed, the result will be damage to the hull or catch assembly. Once caught on the hook, the boat can be powered off, and motor tilted up. Attach the safety chain and tow away onto the hard (parking area). This bow retainer set-up has to be a marriage saver !